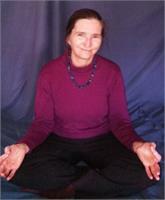 Maria has practiced reiki for the past 10 years. Maria is a level two practitioner of Gendai Reiki Ryoho and has studied with Reiki Master Ivor Edmonds. The gentle and healing work of reiki is just one way that Maria reaches out to others. She has worked as a nurse, volunteers at a soup kitchen in Allston, and is part of a food co-op. Other community work includes being an ombudsman (patient advocate) at two nursing homes and running a folk dance for twenty years. Maria is available for reiki treatments at Taireiki Yoga. While reiki is good for everyone, she is especially interested in working with seniors and children.